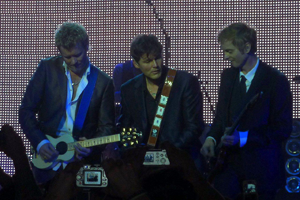 In October 2009, A-Ha announced they were to split following a final world tour. Here The Electricity Club looks back at the career of the Scandinavian phenomenon, and reports from the Brighton Centre, the scene of one of their final UK shows. It has already been an incredible year for fans of the Norwegian trio, one that has seen the release of remastered editions of Hunting High and Low and Scoundrel Days , an updated version of Jan Omdah’s insightful book The Swing of Things , a final single ‘Butterfly, Butterfly’<, a perfectly sequenced compilation album 25 and, finally, a medium where Morten Harket, Paul Waaktaar-Savoy and Magne Furuholmen have become increasingly more comfortable with over the years: the live arena. The band officially retired following four nights at the Oslo Spektrum on 4th December 2010. It’s the first night of the UK leg of A-Ha’s 70-date Farewell Tour, subtitled Ending on a High Note. And the popular Norwegian trio are doing just that, rounding off a memorable career with a tour and setlist that encompasses every facet of their illustrious 25-year journey. “Let’s make it a celebratory thing,” announces keyboardist Furuholmen a few songs into the set. The build-up to the finale in Norway’s capital is ten dates in the UK; and the British market has certainly served the trio well since ‘Take On Me’ made its global stranglehold on the charts 25 years ago. Of course it was Jennifer Rush’s corny ballad ‘The Power of Love’ that prevented this iconic single from hitting the top of the charts in the UK in 1985, and the history books show ‘The Sun Always Shines On TV’ as their only number one hit in this territory. It’s this powerful synth-rock epic that they open with tonight. Somewhat surprisingly, it is one of only three songs from their debut album that they will play tonight, and it’s a disappointment not to hear the likes of ‘Train Of Thought’ and ‘Living A Boy’s Adventure Tale’. Those fortunate enough to see them at the Royal Albert Hall in October will have delighted in the fact that they played their first two albums in their entirety. Scoundrel Days (arguably their best album), is well represented tonight though, and accounts for almost a quarter of the 21-track set. Its brilliant bloodstained title track is given another well-deserved airing, with its bleak, tension-filled verses and a soaring chorus that has become something of a trademark. The south coast crowd are also treated to a rather raw version of the epic ‘Manhattan Skyline’, which is punctuated with some beautiful harpsichord playing by Furuholmen and some unsettling bursts of megaphone singing from reluctant frontman Harket. ‘I’ve Been Losing You’s opening bars still send shivers down the spine after all these years, while ‘We’re Looking For The Whales’ gets a surprise inclusion in the set at the expense of ‘The Swing Of Things’. ‘Cry Wolf’ gets an extended workout with some pounding drums from drummer Karl-Oluf Wennerberg, and Furuholmen even manages to subtly incorporate hints of The Doors’ ‘Riders On The Storm’. Of course, it was the legendary Californian quartet who were to prove influential on recordings such as the East Of The Sun West Of The Moon album; and on earlier tracks such as ‘Here I Stand And Face The Rain’, you can certainly hear their influence. 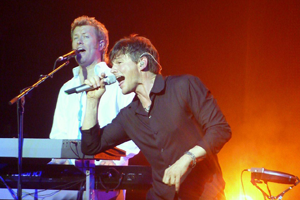 A-Ha have also been influenced by other 60s luminaries over the years such as The Beatles and The Everly Brothers. Tonight the latter’s ‘Crying In The Rain’ is performed during a momentum-halting mid-show campfire spot alongside swansong ‘Butterfly, Butterfly’ and ‘(Seemingly) Nonstop July’ where the band are reduced to playing a baby grand piano and acoustic guitar. A-Ha’s 60s influences were certainly more prevalent in the early 90s as the band gradually moved away from the electronics that had permeated their earlier recordings. By 1993’s Memorial Beach album, A-Ha had finally shrugged off their poster-boy image as they adopted a fuller, rockier sound for the American market. From that album they play ‘Move To Memphis’ during a first half of the set that is dominated by hit singles. 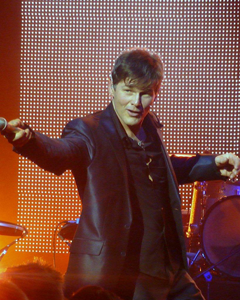 Following the Memorial Beach album, A-Ha were placed on hiatus while Harket commenced a solo career, and Waaktaar-Savoy formed the sadly overlooked indie-pop band Savoy with his wife Lauren. Meanwhile, Furuholmen dabbled in soundtrack work whilst continuing to pursue his interests in the art world. 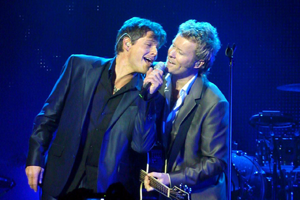 Fast forward to the new millennium and the end of A-HA’s so-called ‘seven-year-itch’, and the newly-focused trio were a slightly more democratic affair; less reliant on the tension-fuelled creativity of Messrs Waaktaar-Savoy and Furuholmen, and employing more of Harket’s lighter material. With chief songwriter Waaktaar-Savoy effectively writing for 2 bands, Furuholmen was able to build on his reputation as an excellent songwriter with beautiful compositions such as ‘Lifelines’ and ‘Birthright’. By 2005’s Analogue album, they were once again flirting with a rockier sound. At the Brighton Centre they perform the title track of that album, with its simplistic piano riff and huge chorus, and the laconic Waaktaar-Savoy is given another chance to rock-out. From 2002’s Lifelines opus we get the Harket-penned ‘Forever Not Yours’ and from Minor Earth Major Sky we get the powerful title track and ‘Summer Moved On’, the vocal ‘tour-de-force’ that announced their reunion in 1998. Incredibly, even at the age of 51, Harket can still hit those notes and you soon forget how ropey the sound in the auditorium is. By 2009, A-Ha were revisiting their electronic roots. Foot Of The Mountain , which easily sits alongside some of their best work, was a solid 10-track album that proved it was possible to be both contemporary and retro. It played to the band’s strengths, with all the material being penned by Waaktaar-Savoy and Furuholmen. Synth Britannia influences such as Depeche Mode can be heard on tracks such as ‘What There Is’. Indeed, in recent years the band have covered ‘A Question Of Lust’, and also Soft Cell’s ‘Say Hello, Wave Goodbye’. Elsewhere on the album, the beautiful epic closer ‘Start The Simulator’ recalls vintage OMD, when the Liverpudlian duo were writing intelligent pop songs about oil refineries and the atomic bomb. And let’s not also forget that ‘Take On Me’s main synth riff was composed in 1981. Debut album Hunting High and Low also has another key Synth Britannia connection – the bulk of it was produced by Tony Mansfield who had previously fronted the synthpop act New Musik. Mansfield would later produce the likes of Naked Eyes, whose debut album Burning Bridges is notable for being one of the first albums to significantly feature the Fairlight CMI, an instrument that was to feature heavily on A-Ha’s debut. Mansfield also produced the original version of ‘Take On Me’ that was released in 1984 selling just 300 copies, before Alan Tarney was recruited to produce the timeless version that we all know and love. It’s funny to think that A-Ha’s two biggest hits were helmed by a man synonymous with writing and recording for Cliff Richard, but Tarney’s pop sensibilities were to prove crucial while the band were developing their sound, and his services were retained until 1990. Unsurprisingly, it is *that* single which is played in a finale that includes a rather overblown version of ‘The Living Daylights’, the James Bond theme from 1987 that indicated just how far this Norwegian export had come in the space of just a few years. At this point in the show, the people in the balconies finally wake up and rise to their feet, but it all feels like an anti-climax as emotion quickly turns to cynicism. Is this supposed farewell tour a shameless marketing opportunity, or will this pop phenomenon reunite again in the future? It’s perhaps too early to speculate at this stage as Harket is expected to resume his solo career, and prolific songwriter Waaktaar-Savoy will be turning his attentions to Savoy in the New Year. They have already released six albums since 1996, including a career-rounding retrospective. Furuholmen, who revealed this year that he has been suffering from a heart condition, has announced his intent to work with members of Muse and Coldplay. As for A-Ha their place in the pantheon of intelligent pop music is already assured, and they leave a legacy of nine albums and some wonderful, melancholic pop songs.